The bold Rugby Ring features a separate striking image on three sides. The central main image is the outline of a rugby ball emerging from a black enamel background. The left hand image is a fiery eagle, again formed from the outline of a rugby ball. The right hand image is a silver star wrapped by two swooshing silver lines. 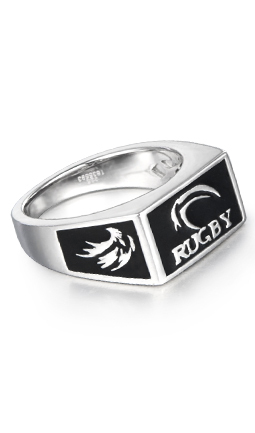 The Rugby Ring is 925-silver with black enamel.